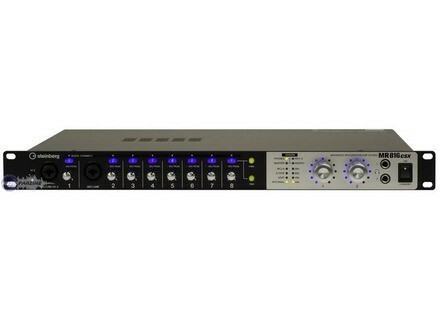 MR816 CSX, FireWire audio interface from Steinberg. Steinberg has released driver updates for the MR816 audio interfaces. Steinberg warns that this version of "TOOLS for MR" is not compatible with Cubase version 4.x, as the Link features are not supported anymore. All Cubase version 4 users should instead use "TOOLS for MR" version 1.6.0. Check out Steinberg for more details. Updates for VSL Products VSL has released maintenance updates for Vienna Instruments Pro, Vienna Ensemble, Vienna Ensemble Pro and Vienna MIR. Steinberg The Grand 3.1 (Mac) Steinberg has released a new update for its virtual piano suite, The Grand 3: The new 3.1 version adds 64-bit support for Mac platforms. Voxengo Marvel GEQ Voxengo announces the release of Marvel GEQ - freeware linear-phase 16-band graphic equalizer plugin with multi-channel operation support (designed to support up to 8 input/output channels, audio host application-dependent).